We’ve been waiting with growing eagerness to share some fantastic news with you, but being a superstitious bunch, we didn’t want to jinx it until we knew for sure. Miah has been out on trial, pending adoption, for the past month with a wonderful horsewoman named Heather who’s been looking for another trail horse to add to her herd. Now when Heather says she’s looking for a trail horse, she means long distance, creek fording, packing, camping, serious Trail Riding!!! 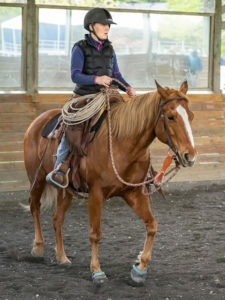 So Miah needed to demonstrate during her trial that she was the sort of horse who would enjoy the wilderness and the adventure of real mountain‐type trail riding. We are absolutely thrilled that Miah proved herself up to the challenge, and her adoption is final!!!! We went riding this weekend a little farther out and longer than what we have been doing. We also changed the route. I put Miah in the lead for all the new trails, I even asked her to take the lead down a single track trail that is through brush and a real tight fit, the kicker is in the middle of the trail there is a creek which at this time of year is about stirrup deep, she went through with only a slight hesitation. The other two horses with us are not water lovers either but since she went through, they went through without a fuss. The poor dog dang near froze since he had to practically swim across! Miah now has all the required trail tack attached (breast collar, crupper, and flank cinch) the only thing left to add is saddle bags and water canteens. If I get home in time this afternoon I may task her to go out by herself, I think she is ready to try that…if it doesn’t happen today it will happen this holiday weekend. 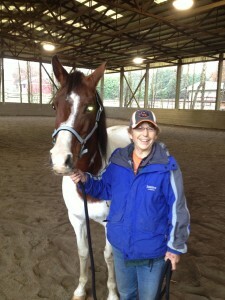 My niece, Lindsay, has been helping me with the horses and with Miah’s care. I let her ride Miah Sunday and she told me “we have a problem…I am falling in love with Miah” the end result…Miah has a potential owner if anything happens to me and I can no longer ride. You could call Lindsay my heir since I have no children, she is a very detailed (almost nit‐noid) responsible horse owner as well as a qualified barefoot trimmer. We have been through a lot with Miah, so seeing her end up in such a great place is a cause for celebration. We want to thank three people who were key to Miah’s transformation from a wild little mare to the horse she is today. 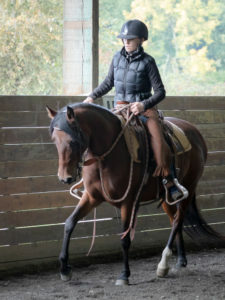 Andrea Lucianna, who re‐started Miah under saddle, taught her to be safely ridden, and to everyone’s surprise, Miah proved to be a quick learner and did very well in training. We were all blown away when we saw the first videos of Miah under saddle, because this tiny mare had a gigantic trot! Miah graduated from training and returned to SAFE Harbor, where Brittney Stewart took over the reins. Brittney and Miah worked hard together, and Brittany quickly found herself admiring Miah’s spirit and bravery, and laughing at her tendency to snort at anything she found troubling. 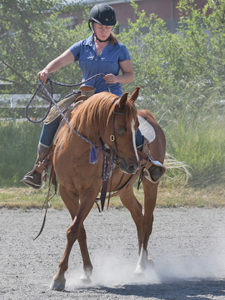 Brittney later handed the responsibility of riding Miah to volunteer rider, Casey A, and the two of them became a lovely team, competing in dressage at the SAFE Benefit Show in August. We are so grateful to Andrea and Brittney and Casey for helping Miah along and getting her to a point where she could be so successful in a new home. She’s a lucky girl, and we can’t wait for more updates about her adventures with Heather! news! So enjoy learning about brave Miah! Wishes to Heather & Miah for a Happy New Year & many happy trails! !